As I've mentioned both in my personal blog, IzzaGlino and here in SavingsPinay, traveling is one major thing that I am hoping to accomplish this 2016. I already posted the places I wanted to visit and thankfully this February I will be going to the first one, Pampanga. When I put traveling as part of my 2016 bucket list I knew that it will be very costly. Actually money is the main reason why it had always remained as a wish list for years. And then I saw this powerful quote that motivated me to do it no matter what. And so today I'll share the things I did and I am continually doing to establish a travel fund and make it happen. I also included actual lessons I have researched. For the first month of 2016 I've been very frugal when it comes to my food consumption. My lunch is about 50-75pesos a day compared to last year when I spend 100-120pesos eating on fast food chains. I try as hard as I can to go out of the house at 6:30am so I cam have a leisure time to walk the street going to the FX Terminal instead of paying 8pesos for the pedicab. Another new thing is how I manage not to shop for any makeup. So far I still live by the make ups I accumulated last year though of course the kikay in me miss buying new makeup so much. 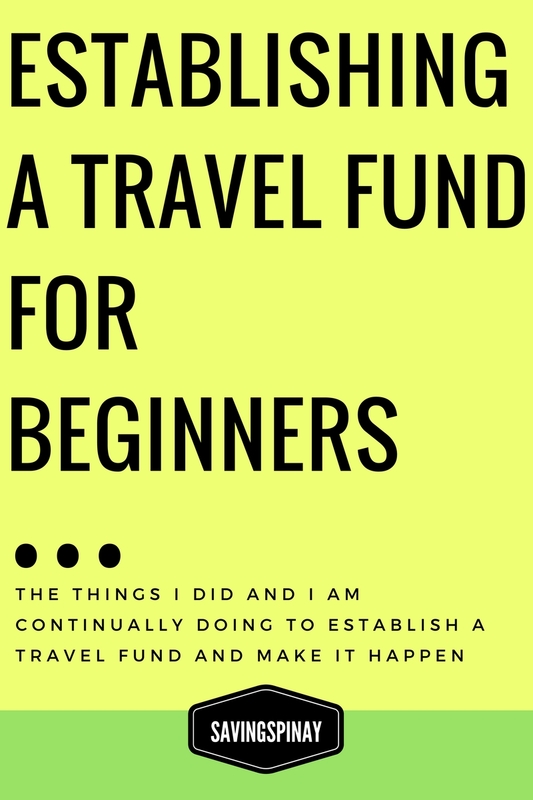 The thing is you need to cut down on your spending and live as frugal as possible if you want to establish a travel fund. List down the your expenses in a month and determine any item you can cut down like movie nights, dinners or subscription from magazine etc. Of course once you cut down your expenses you need to save the amount. You can open a new savings account here or use your existing. You can also create a jar at home to physically save the amount though you might want to hide it in a safe place. Use your talent and your spare time to earn more. If you will just research then you'll surely find other means to fund your travel. How Much Money Should You Save Each Month? - New! If you are really committed in traveling then you can start selling your unused stuff that are still marketable. You can start a garage sale or an ukay-ukay instagram shop. You can even put "I want to establish a travel fund" as the reason why you selling your stuff away. People will surely support the cause. Currently me and my bff Nica have plans of opening an Instagram shop. The proceeds of that shop will surely go to my travel fund as well. Over the weekend I went on a day hike at Mt. Manabu Batangas and I must say it felt so fulfilling. I never hiked before and had never committed into something extreme. It was also the first time I became so close to nature. At the summit I breathe life... nature... air that will hug your innermost being. That experience is priceless. Its beyond anything one can imagine. I felt different afterwards. So put travel in your priorities. Widen your horizon. Expand your world. Even if you have no idea how you can fund it... make a way.